Since The Star of David Is A Satanic Hexagram, What Is The Biblical Symbol For Israel? Title: Since The 'Star of David' Is A Satanic Hexagram, What Is The Biblical Symbol For Israel? Subtitle: We received some pointed criticism for our Newsletter revelation that the 'Star of David' is not God's symbol for Israel, but is Satan's symbol. What, then, is the Biblical symbol for the nation, Israel? You might be very surprised. The New World Order is coming! Are you ready? Once you understand what this New World Order really is, and how it is being gradually implemented, you will be able to see it progressing in your daily news!! Learn how to protect yourself, your loved ones! Stand by for insights so startling you will never look at the news the same way again. Copyright © 2007 Cutting Edge Ministries. All rights reserved. See full copyright notice below. One of the most sensitive issues with which secular Israelis and many Messianic Christians struggle is the hexagram on the flag of the modern state of Israel. Satanists recognize this symbol as one of their favorites, and most powerful, i.e., the hexagram. However, secular Jews and many Messianic Christians insist that this symbol is not a hexagram, but is the "Star of David". Such apologists also insist that the symbol has to be all right, because King Solomon was the one who selected the symbol. We write this article in order to set the record straight -- hopefully for the last time. * NEWS1643 - "Fervent Masonic Desire Is To Rebuild Solomon's Temple On The Temple Mount - Is Also Driving Force Behind All Middle East Events"
* NEWS2128 - "Properly Understanding On Of The Most Important Illuminati Planning Documents - The Protocols of the Learned Elders of Zion"
In the News Alert for July 24, 2007, I reported that the Hexagram was not the symbol for Modern Israel. Pointed criticism immediately flew my way from a very sincere and very distressed Messianic Christian. I write this article to clear up one of the greatest misconceptions in this modern era. The hexagram is Satan's symbol for Israel, while the menorah is God's symbol. Listen to Dr. O.J. Graham, above, as he begins our discussion.
" 'Not my brand of Judaism. We use the Menorah.' (Orthodox Jew replied)"
Can this be true? Is it possible that God's mandated Menorah is the real symbol for Ancient Israel, and not the "Star of David"? "The menorah (Hebrew: ????? ), is a seven branched candelabrum lit by olive oil in the Tabernacle and the Temple in Jerusalem. The menorah is one of the oldest symbols of the Jewish people. It is said to symbolize the burning bush as seen by Moses on Mount Sinai (Exodus 25). " Did you catch that pertinent quote? 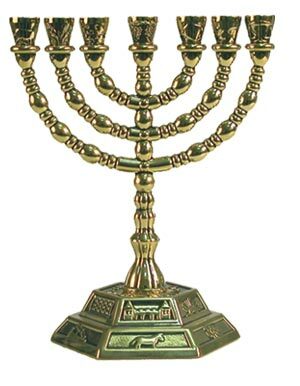 The Menorah was the symbol of Judaism "from antiquity to contemporary times". Let us now return to a discussion as to how the Hexagram is really a Satanic symbol which apostate Jews have used since the time of Ancient Babylon and Egypt. Is you just glance at the Israeli flag, you will easily see that the dominant symbol is a Satanic hexagram! Yes, it is called a "Star of David", because King Solomon adopted it as a main symbol when he was building pagan temples for some of his pagan wives. Former Satanists adamantly state that King Solomon actually became one of the most powerful Shamans in world history, having slipped deeply into the practice of the occult. Let us now examine the writings of Dr. Graham to see how correct former Satanists have been on this subject. Please ask yourself: where in the Bible the hexagram is used as a symbol of Israel? I really want to see that Scripture and verse reference. If you can find it, please let me know. My research tells me that the hexagram is one of the Satanic symbols with which apostate Jewry fell in love time and time again in Israel's long ancient history. Then, when the time had arrived for God to bring Satan back to her land, in fulfillment of so many Old Testament prophecies, He allowed Satan to actually bring Israel back, in fulfillment of the prophecy of Ezekiel 37:8d, where God prophesied that He would bring Israel back to life, and stand her on her feet, but initially put "no spirit" in her; since Bible scholars have always recognized that this is a reference to the Holy Spirit, and since the Holy Spirit always testifies of Jesus (John 15:26), this prophecy must mean that Israel will return initially to her land, without a belief in Jesus Christ as Messiah. And, of course, this is exactly what occurred. The most important Illuminati family ever, the Rothschilds, were instrumental in raising up the Zionist Movement in 1896, in funding its activities, and then forcing the Illuminati leaders of Israel in 1948 to adopt the hexagram as their national symbol. Well-meaning Christians today are allowing themselves to be duped into supporting Israel today, for that leadership is deeply Satanic and is actively supporting the coming Masonic Messiah, and the rebuilding of the Temple for him. this current Israeli leadership is planning to build the next Temple - which too Christians have supported - which is going to be the Temple of Antichrist. Israel is proceeding to complete fulfillment of prophecy, which will culminate in the Masonic Christ (Antichrist) coming to the world scene, deceiving Israel and then being slaughtered in fulfillment of Zechariah 13:8-9, where God will allow Antichrist to kill 66% of all Jews. This is the point where all these Illuminati Jews will meet their Maker. 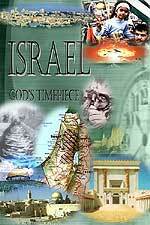 Then, Israel will be composed only of the Christian remnant whom God has preserved. When Jesus returns, He will return to a Christian Israel. THAT is the Israel upon which I have my eye and my affections. THAT is the Israel for which Evangelical Christians ought to be praying. 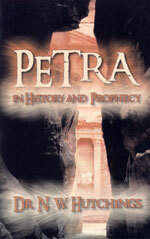 Our Petra DVD tells the story of how God is preparing Petra to be His hiding place for the one-third remnant which God is going to divinely protect. Events in Israel are setting the stage for the last fulfillment in world history. Are you spiritually ready? Is your family? Are you adequately protecting your loved ones? This is the reason for this ministry, to enable you to first understand the peril facing you, and then help you develop strategies to warn and protect your loved ones. Once you have been thoroughly trained, you can also use your knowledge as a means to open the door of discussion with an unsaved person. I have been able to use it many times, and have seen people come to Jesus Christ as a result. These perilous times are also a time when we can reach many souls for Jesus Christ, making an eternal difference. If you have accepted Jesus Christ as your personal Savior, but have been very lukewarm in your spiritual walk with Him, you need to immediately ask Him for forgiveness and for renewal. He will instantly forgive you, and fill your heart with the joy of the Holy Spirit. Then, you need to begin a daily walk of prayer and personal Bible Study. If you have never accepted Jesus Christ as Savior, but have come to realize His reality and the approaching End of the Age, and want to accept His FREE Gift of Eternal Life, you can also do so now, in the privacy of your home. Once you accept Him as Savior, you are spiritually Born Again, and are as assured of Heaven as if you were already there. Then, you can rest assured that the Kingdom of Antichrist will not touch you spiritually. If you would like to become Born Again, turn to our Salvation Page now. We hope you have been blessed by this ministry, which seeks to educate and warn people, so that they can see the coming New World Order -- Kingdom of Antichrist -- in their daily news. Finally, we would love to hear from you. You can contact us by mail or email. Copyright © 2007 Cutting Edge Ministries. All rights reserved. This password protected article and its contents are protected under the copyright laws of the United States and other countries. This article is provided by subscription only for use by the subscriber and all other rights are expressly reserved by the copyright owner. Copying and pasting this article, in whole or in part, into e-mails or as attachments to e-mails or posting it on the Internet is strictly prohibited and may subject the offender to civil liability and severe criminal penalties (Title 17, United States Code, section 501 and 506). Copying and distributing this article in violation of the above notice is also a violation of God's moral law. Become a Headline news subscriber HERE.